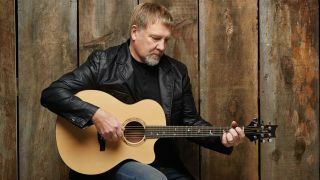 Delivering similar specs to the Rush legend's Private Stock acoustic guitar at a much lower price point, the SE Alex Lifeson Thinline Acoustic features a thinner body depth than PRS's regular Angelus range for increased comfort and practicality on stage. Lifeson's Thinline features a solid spruce top with dao back and sides, and PRS's X-brace/classical hybrid design bracing, which promises increased resonance and warmth over other thinline acoustics. In addition, the guitar features an under-saddle pickup with volume and tone controls, plus a bone nut and saddle, and PRS's trademark 'birds in flight' fretboard inlays. The SE Alex Lifeson Thinline Acoustic will be available in Europe from early May 2015 for £889. Check out the demo video above and the PRS website for more info.